NSW’s Cody Maynes-Rutty finished on the podium in the two-round Autumn Trophy that concluded at Lonato, Italy, on the weekend. Competing in the National Mini class with Scuderia PCR, Cody was 5th in the final which placed him equal second on points for the series with Baby Race Academy’s Patrik Fraboni, however he dropped to 3rd on count-back. Cody Maynes-Rutty, 3rd at the Autumn Cup, Italy. 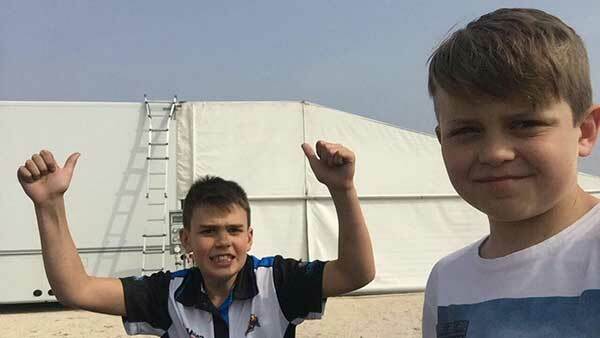 In preparation for this weekend’s ROK International Final, a huge field of Mini Rok assembled for the event (106 drivers registering a qualifying time) and included Australian Cadet karters Oscar Targett & James Wharton, both aboard JC Karts with the Parolin team. The duo put in an excellent performance, both making the ‘A’ Final. 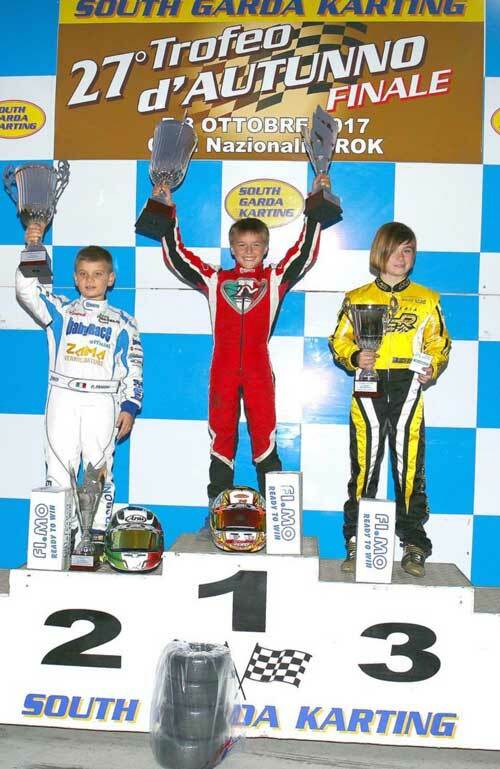 Broc Feeney (Kosmic) competed in Junior Rok, qualifying 12th in a 56-kart field. He finished 17th in the ‘A’ Final. Kyle Henry-Smith (PCR) competed in Super Rok, taking 10th in the final. 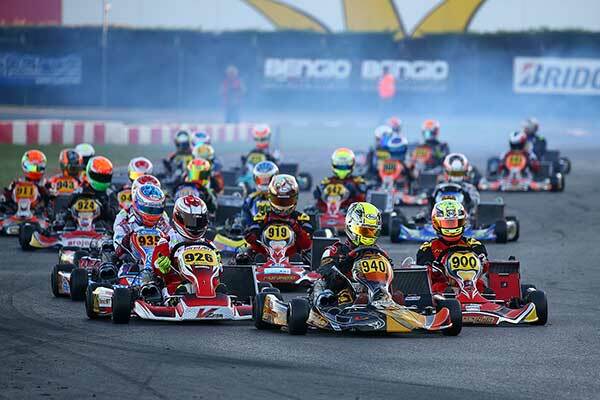 A perfect organization has marked once again this 27th edition of the Autumn Trophy held at the South Garda Karting. This event has scored record figures with a total of 510 drivers that made it to the track counting the 160 drivers present on October 1st and the 350 that took part in the grand finale on October 8th. The second round of the 27th Autumn Trophy has seen an “invasion” of Rok Cup drivers for a test ahead of the Rok Cup International Final to be held in Lonato on October 14th that joined the drivers competing in the national categories KZ2, KZ3, KZ4, OK-Junior, 60 Mini and Entry Level. This contributed to produce such an important event that will be remembered in the history of Italian karting both in terms of participation and organization of this high level event. KZ2. National categories have been battling out the Autumn Trophy and the highest category (i.e. KZ2) has seen the Italian driver Giuseppe Palomba (Intrepid-Tm) coming to the fore as the absolute protagonist of the weekend after his unlucky presence on October 1st. Palomba has dominated qualifying, posting the quickest time, and won Prefinal and Final. A good performance was also put in by Massimo Dante (Maranello-Tm), who had won the previous race and scored a second place here right behind Palomba. These results earned him the victory of the KZ2 Autumn Trophy. The other great protagonist of KZ Manuel Cozzaglio ended third in this round and claimed the second place of the classification behind Dante on BirelArt-Tm. KZ2 Autumn Trophy Classification: 1. Dante points 87; 2. Cozzaglio 80; 3. Zoanni 72. KZ3 JUNIOR – KZ3 UNDER. 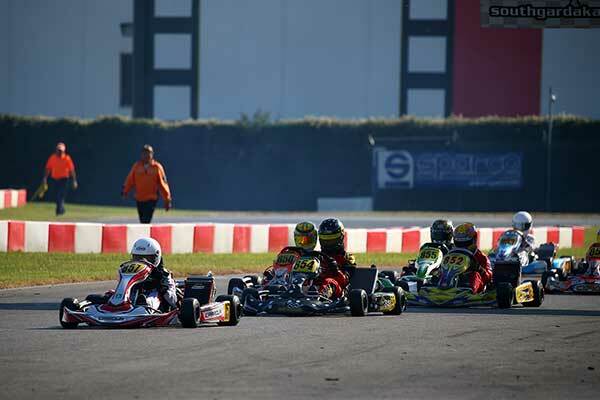 In KZ3 Junior and KZ3 Under, categories that got on track at the same time, “Skeed” claimed the victory in KZ3 Junior on Formula K-Vortex, leading Roberto Cesari (Oberon-Tm). The KZ3 Junior Trophy went anyway to Cesari who had taken the win in the first round. In KZ3 Under, the Trophy went Riccardo Nalon’s ways (Formula K-Tm), as he was third absolute in the final but had won the first round. KZ3 Junior Autumn Trophy Classification: 1. Cesari points 87; 2. “Skeed” 83; 3. Denti 79. KZ3 Under Autumn Trophy Classification: 1. Nalon points 90; 2. Melas 84; 3. Quintarelli 78. KZ3 OVER – KZ4. The two categories KZ3 Over and KZ4 also competed in the same race. In KZ3 Over, Cristian Griggio (Maranello-Tm) repeated the victory taken in the first round and therefore secured the Title, as did Mauro Moretti (Tony Kart-Vega) who won both rounds of KZ4 and claimed the title with them. KZ3 Over Autumn Trophy Classification: 1. Griggio points 90; 2. De Palma 82; 3. Montagnani 77. KZ4 Autumn Trophy Classification: 1. Moretti points 90; 2. Giberti 84; 3. Antoniello 80. OK-JUNIOR. 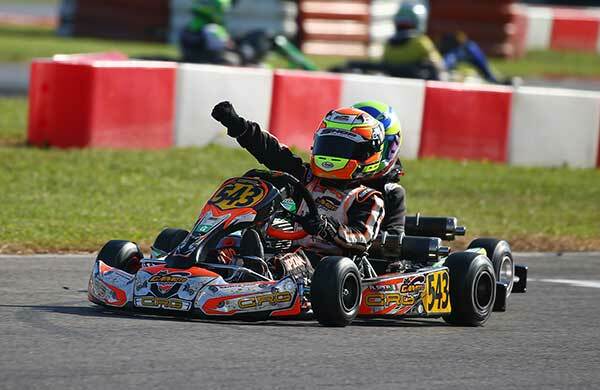 The young Sicilian Gabriele Minì (Parolin-Iame) dominated OK-Junior at the debut in this category, after recently winning the Italian 60 Mini Championship. Minì won the Final leading the German Luis Speck (TB Kart-Iame) and Mattia Signorelli (Tony kart-Tm). The Trophy was won by Signorelli, who came third in the previous round. OK-Junior Autumn Trophy Classification: 1. Signorelli points 85; 2. Anderrutti 84; 3. Phoenix 81. 60 MINI. Yannick Federer (Maranello-Tm), the younger brother of KZ2 2011 European Champion Fabian Federer, claimed his maiden win in a national race in 60 Mini. Yannik Federer won in fact the Final proceeding Patrik Fraboni (Tony Kart-Tm) and the Austrian Kiano Blum (CRG-Tm). The victory of the Trophy went to Federer thanks also to the third place scored in the first round. 60 Mini Autumn Trophy Classification: 1. Federer points 85; 2. Fraboni 76; 3. Maynes 76. ENTRY LEVEL. The victory in Entry Level went to Paolo Russo (Evokart-Lke), who proceeded Mattia Prescianotto (CRG-Lke) and the winner of the previous round Christian Romeo (Tony Kart-Lke). In the classification of the Trophy Russo and Romeo ended equal on points, but the Trophy went to Romeo because he had a better qualifying score in this round. Entry Level Autumn Trophy Classification: 1. Romeo points 87; 2. Russo 87; 3. Sala 80. MINI ROK. Mini Rok has been the most crowded category with its 107 drivers. A great duel for the victory has been put on by Alfio Spina and Tymoteusz Kucharczyk, both on CRG-Vortex. Spina eventually won the sprint to the line proceeding Kucharczyk, while Cristian Bertuca (Evokart-Vortex) was third. JUNIOR ROK. A great battle for the victory has been fought also in Junior Rok. The winner has been Luca Bosco (Tony Kart-Vortex), as Edoardo Ludovico Villa (TB Kart-Vortex) and Paolo Ferrari (Tony kart-Vortex) rounded off the podium after overtaking Francesco Sabella (Tony Kart-Vortex) in the closing laps. SENIOR ROK. In Senior Rok, the Swiss driver Michael Muller (Tony Kart-Vortex) closed his comeback race taking the victory from the two Polish drivers Szczurek Kacper and Szymon Szyszko, both on Kosmic-Vortex. Anderson Sella has been the first of the Italian drivers, fourth on Tony Kart-Vortex. SUPER ROK. In Super Rok Mattia D’Abramo (Tony Kart-Vortex) had the best of Giuseppe Gaglianò (Tony Kart-Vortex) and the South African Sebastian Boyd (Kosmic-Vortex) at the end of a race led throughout. SHIFTER ROK. In Shifter Rok Danilo Albanese (Tony Kart-Vortex) took the victory leading Alessandro Buran (PCR-Vortex) at the end of a good race. The battle for P3 was won by Jacopo Guidetti (VRK-Vortex), who proceeded the Swiss Samuel Luyet (Tony Kart-Vortex).